I’ve always been a DIY kind of guy when it came to technology, and the idea of giving my data to cloud services such as Dropbox or Box.com (and whoever has access to that data besides them) seemed a little iffy. 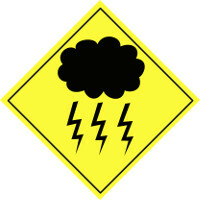 The cloud, as great as it is for some things, isn’t really built for too much security. Keeping data private on an internal system is hard enough, but throwing it out to the internet only multiplies these issues. That’s where BitTorrent Sync comes in. Built by BitTorrent Labs (and using the BitTorrent Protocol), this solution boasts that it will allow you to sync between different OSes, securely, and without throwing any of it out to the cloud. This increases security incredibly, and isn’t that hard to set up. I put it on my Linux laptop (Stu) and a Windows 8 desktop (Zer0), both of which I’ve used in previous projects. It works, but it has a few caveats as you’ll see below. Linux installation is fairly easy, if a bit obtuse. Instead of an installer of any kind, the package for BitTorrent Sync comes with a License.txt file and a single btsync binary. 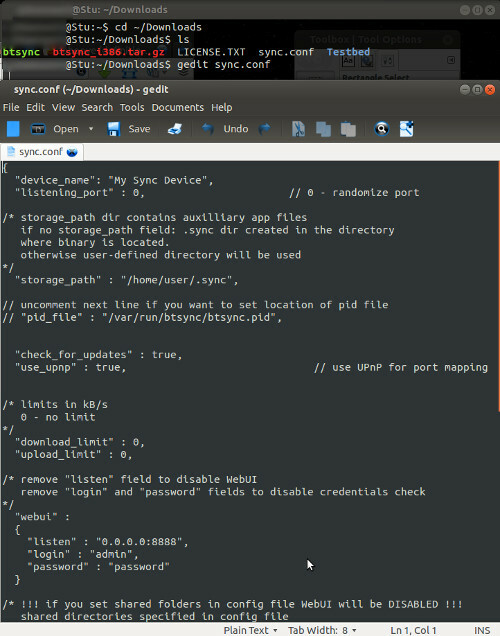 To start up the software, simply unpack it, navigate to the containing folder in a terminal and run the ./btsync command. That’s it. The Linux binary can be configured through the webGUI (kinda) or the more robust sync.conf file. From there you can select the folder you want to sync as well as generate a secret key for said location. The key is to allow other computers on your network to access the folder securely. Barring any conflicting firewall settings on your local machine, this should just be a matter of putting in the secret when you add a folder. If you need the key from a folder you’ve set up previously, you can get it again from the gear icon next to the listing in BitTorrent Sync. Also, if you head to the Advanced tab you can grab a “Read-Only” secret. If you use this key when setting up another computer, it will read from the folder but never write to it. This is useful if you want the updates to go only one way or you want to give someone the ability to see what’s on your machine without running the risk of them deleting or altering the files. Next, I went to Zer0, my Windows machine, and installed the software. From what I understand, the Windows and MacOS versions are pretty much the same, so other than the intricacies of the Mac platform the installation and use should be very similar. The Windows application is a little plain, but gets the job done. After running the installer, you’ll be presented with a page that has several tabs. Go to the “Shared Folders” tab and click on “Add”. Put in the secret from the share that we want to access and click “Okay”. It should have all the information it needs to connect and start syncing. Mine did it automatically and pulled the four or so test files with no further work on my part. You can also add a local folder and sync it here. By default it’s the btsync folder in your Documents directory. I just left this as it is for my testing purposes. Now that it’s set up, you can do a few more things to shape it to your preferences. As you first may have noticed you can add any number of folders to sync, for no cost unlike most cloud services. So if your primary concern is just moving files back and forth behind the scenes (as I do) then that’s probably this setup’s greatest strength beyond security. lan_encrypt_data: If True, BitTorrent Sync will encrypt data sent over the local network. Turn this on if you want to hide your traffic from others who may be using the same network as you. lan_use_tcp: If True BitTorrent Sync will use TCP instead of UDP for local transfers. Will use more bandwidth but will be (at least theoretically) more reliable. rate_limit_local_peers: If True, BitTorrent Sync will apply rate limits (set in General Preferences) to local users. By default rate limits are only applied to external peers (those not on your network). In Linux, these options as well as a few others are all stored in the configuration of btsync. You’ll need to go to the folder that you have btsync running in to access it. First, you’ll probably want to output a sample configuration and open it in a text editor to see all options you have. There are quite a few. It’s pretty self-explanatory, but I want to direct your attention to the username/password fields. Remember that webpage we went to earlier to set up the shared folder on Linux? Well it’s actually hosted from your machine, meaning that anyone who as the access to the network can pull up your BitTorrent Sync options and mess with them. So it might behoove you to set this option. 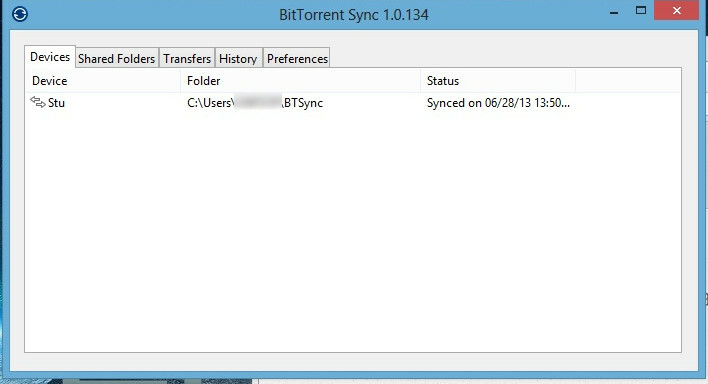 And that’s pretty much the ins-and-outs of the BitTorrent Sync application. I imagine that I’ll be using this not as my primary software to sync things between machines or as backups, but I will have it move files and folders from one machine to another periodically. Perhaps one could set up a backup drive on a server that just copies one way from all the machines that are linked to it. I imagine that could be a project for a different day. On the whole this is a nice piece of software that pretty much does what it says it’s going to do, and securely. I know it’s Linux, but the lack of a real GUI and the complication of editing advanced options by way of the .conf file is kind of a downer. I’m totally fine with using the command line (in some cases I prefer it), but that drags down the score a bit on this one because it’s not very user friendly. Still, a fine piece of software that I will definitely be utilizing in the future. Rating: 4.5/5 – Pretty darn good. However, the Linux version takes a little work to get customized and the Windows/MacOS advanced pages are a little confusing at first.